A year ago, Jim Furyk missed the cut at the Memorial Tournament for the only time in 16 years. It was emblematic of his season. “I had my best season in 2010 and drove right into my worst season in 2011,” Furyk said yesterday. He slumped from second in earnings in 2010 to 53rd, but now the 2002 Memorial champion believes he’s on his way back. He’s 24th on the 2012 earnings list with $1,542,689. “I did a little soul-searching and had some things to figure out in the offseason,” Furyk said. “ I worked out really hard in the offseason, probably more than I ever have. 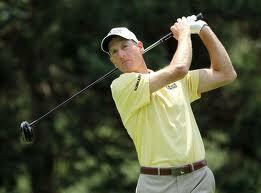 Furyk, 42, has made some technical and equipment changes, but most of the improvement has come between the ears. The Memorial is a special tournament to Furyk, and not just because he is a past champion and has six top-10 finishes here. His wife, Tabitha, is from Columbus, so the tournament serves as a quasi-reunion for their family. He also grew up in Pennsylvania idolizing Jack Nicklaus. “Getting that trophy from Jack on the 18th green is pretty special,” he said.